What a great space! This huge (but still atmospheric) magnificent Victorian warehouse has been cleverly split and designed to make each zone feel comfortable, functional and cosy. The styling is lovely and if you have ever been to India you will get it immediately. Retro B/W photographs cover the walls, vintage 1920/30s fan spinning overhead and plenty of original railway station memorabilia is dotted around to give the feel of a grand old Indian railway station from times gone by. There’s a cool cocktail bar (continuing with the cool retro railway station café veranda theme) in the basement serving a wonderful collection of Spicy Oriental Gin inspired cocktails along with all the old favourites, like their wonderful Bombay Martini and a selection of ice cold beers. Now, in the restaurant itself, if you like Indian food, then you are in for a treat, every dish seems to be crafted with experience, love and as traditional as you could get, which probably contributing to the fact that we had to que for an hour to get in due to its popularity, however, we can confirm it was well worth the wait and completely lived up to expectations. 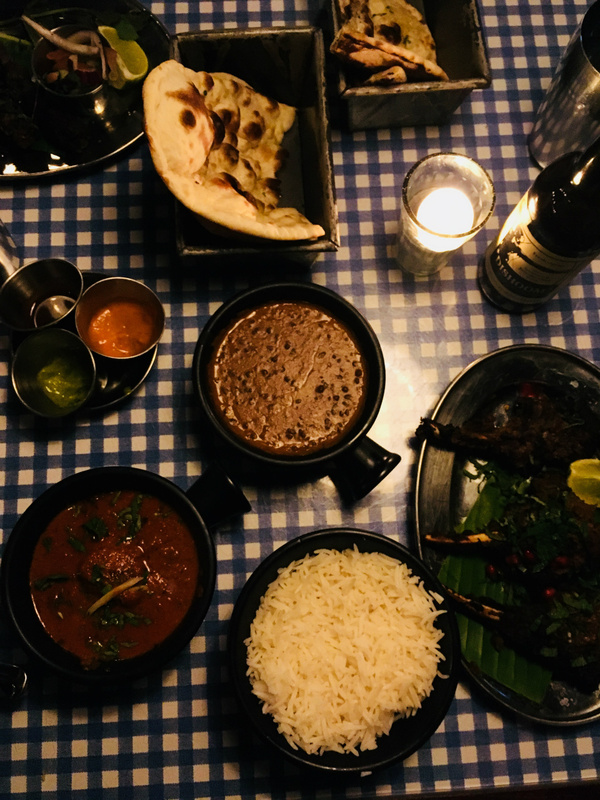 The spicy Calamari, home crafted samosas, signature black dhal, fiery crusted lamb chops served with yoghurt raita & the ‘Ruby Murray’ Chicken curry where all just stunning! The food was reasonably priced; the staff were super-efficient & completely helpful, explaining all dishes in detail, even giving personal recommendations, which is always a great. It’s fun, it’s buzzy and probably the closest you will get to traditional Indian food abroad, without getting on a jet plan, but be sure to book a table as its gets super busy! You can also find other branches of Dishoom in Kensington, Shoreditch, Carnaby Street, Covent Garden & in Edinburgh, Scotland.